I would not likely pick up a random book of short stories, as many of you know by now if you have been reading Dusty Shelves for a while. But I heard about these short stories by Tom Hanks, just after seeing The Post, and I thought it was worth a try. As you may know, Hanks collects typewriters. In this collection of his writings (geesh, how many talents can one person have?) a typewriter plays a role. Sometimes it is a small and insignificant role; sometimes a central and vital role. 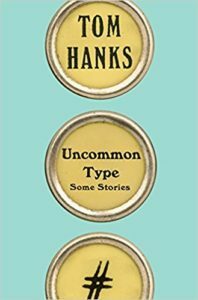 I thoroughly enjoyed the short stories of Uncommon Type, and Hanks book comes with my full recommendation. I kept picturing his quirky and somewhat crooked smile as I turned the page and began a new story. His tales have a light quality, and he develops his characters well in just a few pages. I liked the way his endings did not always wrap things up with big red bow. If you are not a Tom Hanks fan, (which I assume must be possible!) you may not appreciate this book as much as I did. I can’t quite separate the stories from the author. I hope you enjoy! I like Tom Hanks AND short stories so this one has been on my list since I first learned about it. Glad to hear you enjoyed it.